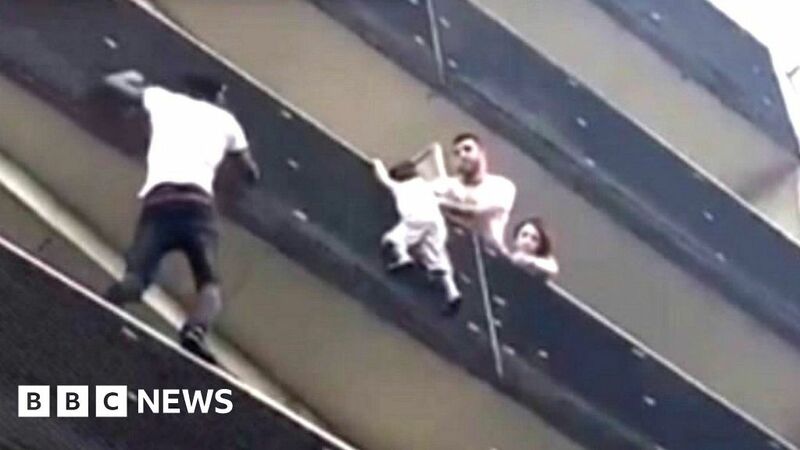 A Malian immigrant was celebrated as a hero after climbing the façade of a building in Paris to rescue a child from a balcony on the fourth floor. 9659007] In less than a minute, he moves from balcony to balcony and grabs the four-year-old, while a neighbor tries to keep the child from an adjoining apartment. President Emmanuel Macron invited Mr. Gassama to the Elysee Palace on Monday to personally thank him. Paris mayor Anne Hidalgo praised the heroism of the 22-year-olds and said she had called him to thank him. The drama was captured in a video on Facebook. She described him as "Spiderman of the 18th", referring to the Paris district where the rescue took place. "Congratulations to Mamoudou Gassama for his courageous act that has saved a child's life," tweeted Mrs. Hidalgo.
" I replied that his heroic gesture was an example to all citizens, and that the city of Paris obviously was interested in helping him in his efforts to settle in France. " Mr. Gassama told reporters he had passed by when he saw a crowd "I have it did, because it was a child, "quoted the Paris newspaper Le Parisien. "I climbed … Thank God I saved him." The Paris Fire Department said crews had arrived to see that the child had already been rescued. Local authorities cited by French media said the parents were the child not at home at this time. The father was questioned by the police on suspicion of leaving his child unattended. The mother was not in Paris at the time, you believe it.